Sarah Rumbellow, a P-3 student, has been selected as recipient of the United States Public Health Service Excellence in Public Health Pharmacy Award for her work with Project Collaborate. Read more about the public health award. Project Collaborate’s mission is to provide quality health screening and health education services to underserved citizens of Texas, provide a means for student pharmacists to enhance their patient interaction and clinical skills, promote interdisciplinary collaboration, and advance the profession of pharmacy. Project Collaborate is an initiative of Pharmacy Council at The University of Texas at Austin’s College of Pharmacy. 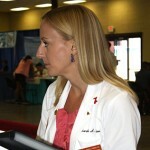 We provide free health screenings at local events and community centers. Our screenings include height, weight, blood pressure, body mass index, body fat percentage, blood glucose, total cholesterol, hemoglobin A1c (for select patients), and diabetic foot screenings (at some events). Patients at events also have the chance to discuss their health questions and concerns with Student Pharmacists and Pharmacist Preceptors. At some events, nurses, dietitians, and social work students may also be available for consultation. Health education materials are also made available at all events. Project Collaborate publishes a quarterly newsletter and maintains a patient-centered Facebook page to help educate the public about health topics. Project Collaborate was started in 2009 by students within the College and has continued to grow it’s impact ever since then. We are always looking for new community partners to work with in order to better the lives of residents in Austin, San Antonio, El Paso, and the Rio Grande Valley.